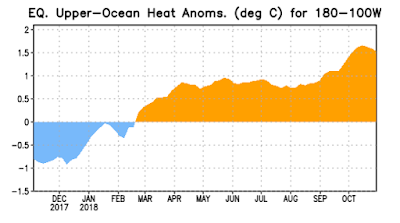 We have known for a while that the tropical Pacific was transitioning from a neutral situation (near normal surface and subsurface temperatures in the tropical central/eastern Pacific) to an El Nino (above normal tropical ocean temperatures). But during the past month, the warming has revved up and we will be officially in an El Nino very soon. And we care about this, because El Ninos tend to make it warmer than normal in the NW with less snow, with the effect stronger as the sea surface temperature warms. The Nino 3.4 area is the most popular, so lets take a look at it. A lot of warming the past month, going from neutral conditions ( within .5C of normal) to almost 1.2C above normal. Should be considered El Nino now. Examining the sea surface temperature anomalies in map form from yesterday (below) shows the warm water along the equator and remnant of the blob in the Gulf of Alaska. The blob is not dead yet! 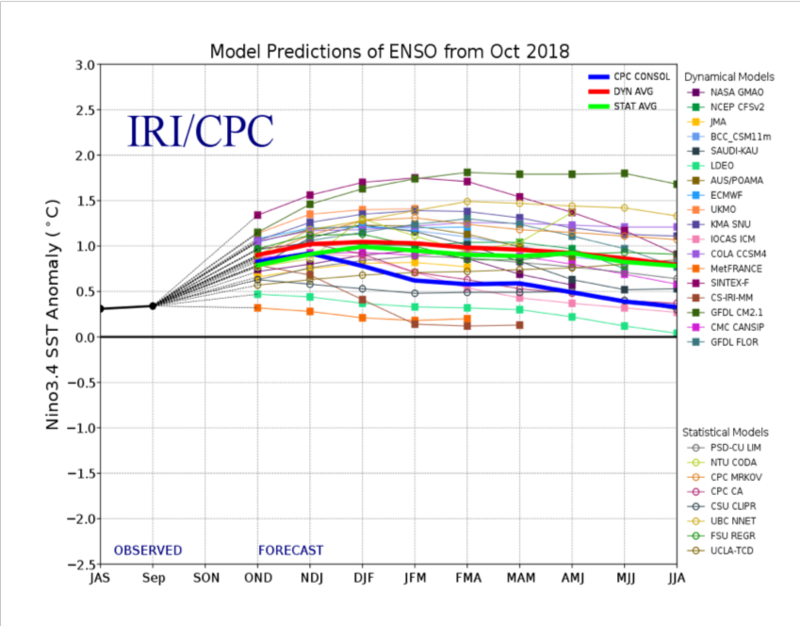 The latest El Nino predictions, based on a collection of forests, projects that we will be in El Nino this winter--with more than a 70% probability. But how strong?....that will make all the difference. 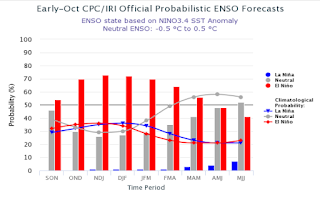 There are several types of models that predict El Nino. Dynamical models simulate the atmospheric and oceans using the full physics of the system. Statistical models are based on past relationships. Both are shown below. 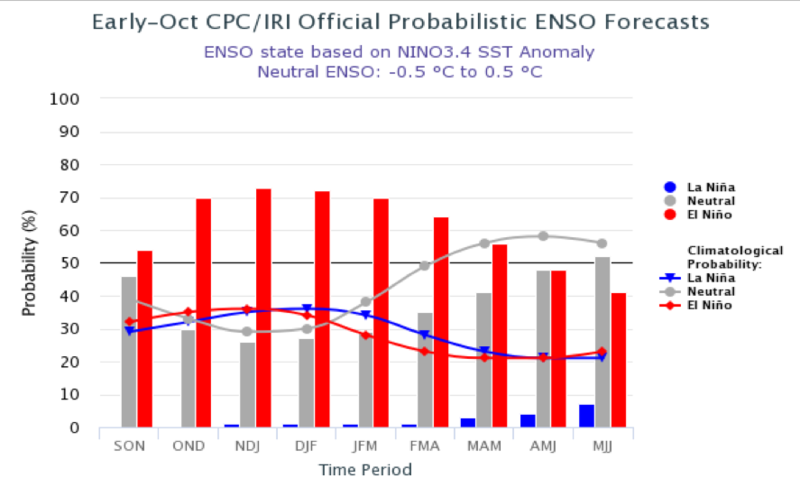 Most models agree that the temperatures in the Nino 3.4 area will warm and are going for a weak to moderate El Nino. Regarding our winter weather, the correlation of El Nino with NW weather is very weak before January 1, so anything goes for the next two months. But if the forecasts are correct and at least a moderate El Nino is in place, expect warmer than normal winter temperatures, lower mountain snowpack than normal and a lowered probability of lowland snow after the new year. What lame, depressing, abysmal weather. In fact, let me just say this- I think this whole year has been downright awful. Nothing interesting, nothing fun, just boring weather and wildfire smoke. This is great news for gardens and anyone who enjoys sun and light. To all the haters: I promise there will still be plenty of cool, dark and wet weather. My thoughts couldn't be further from K's. The weather we are having right now -- cool nights and slightly warm days with broken and scattered cloud cover and an occasional shower -- is so close to perfect that if I had to pick one weather pattern for the rest of my life, this would be it. Maybe add five degrees for total perfection. Boring like this is good. Very good. Not-boring weather is either uncomfortable or expensive to property or dangerous/unhealthy. Smoke qualifies as not-boring weather in my book. Weather isn't here to entertain. It's to either enjoy or suffer through. I prefer the former. Yes, all that endless sun and temps 5-10 degrees above normal is certainly boring. Or Utopia. Depends on how many California transplants you ask. Hopefully we can get some snow pack going in the mountains at least before El Nino takes full control. The rain shadow did not provide much here in Kitsap as far as precipitation or winds in lower elevations. Just more sun and warm. Plenty of moisture has paraded across the region but it was mostly liquid and runoff. Well I'd take a few more days like this today. Here in N Whatcom county we've had 17 inches of rain since September 1. Enough already. Plenty of CA transplants, like me, like cool, cold, even snowy weather ... please stop with this passive aggressive nonsense, sadly of course Cliff condones it. Well, if perfect weather is the topic, I'll throw in my 2 cents worth. I think for shear comfort and utility (meaning, supports the most kinds of outdoor activity) then I'd vote for 70's and sunny, and 60-ish at night. By this measure July (here) is tops. 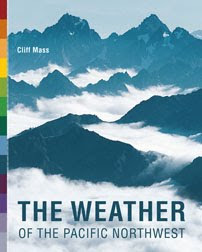 Coming as I do from the East, I think the perfect CLIMATE is characterized by frequent change, and believe it or not the whole west coast fails that test. I like sun but also storms. I like snow- but not too much of the year. I like rain (even with lightning) but not constant drizzle. The only things I really don't like are smoke, very dangerous weather (twisters, though they're interesting from a distance) and prolonged cold or cloudiness. I could live in Hawaii for comfort but might soon miss the seasons. On the other hand, I could live in the Rockies but I would probably get tired of winter at times. So "perfect" is hard to define in this context. Here in the NW I think May scores highest for good balance of weather types. "Plenty of moisture has paraded across the region but it was mostly liquid and runoff..."
Actually most of that moisture went straight into our reservoirs, which as Cliff has pointed out previously is the key to annual water supply. Combined reservoir storage for Seattle went up 8 billion gallons in the last week, in some cases raising reservoir levels +20'. We are now ahead of the 1985-2014 average and ahead of last year at this time - also a year that was substantially above average. Cliff was right with the precip forecast maps: S. Fork Tolt measured almost 10" of precip last week. Huge inflows into the reservoirs. 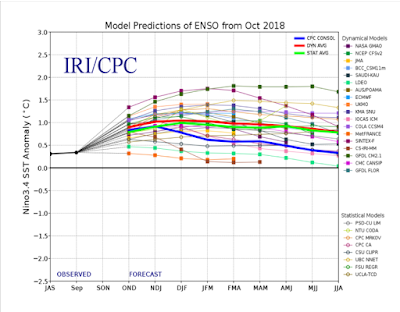 Worth pointing out that another reason not to be excited about El Nino events is that they are associated with big mortality events for seabirds along the west coasts of North and South America, as well as wholesale failures in the southern and northern breeding seasons. 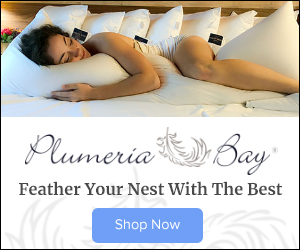 Puts a real hurt on seabird populations that have already been depleted by other human-caused factors, such as oil spills, overfishing, fish by catch, habitat loss, and others. There's more to it than humans feeling a little warmer in the winter. I hate the wet and dark as much as the next guy, but what is winter without snow? Cliff, I'm curious why you didn't include the Souther Oscillation Index in your analysis. The SOI has swung positive leading me to think El Nino has peaked, meaning a moderate El Nino probably isn't likely. The question is, will the SOI stay nominally positive? Also, if the SOI stays nominally positive, how will the El Nino pattern set up in the higher latitudes of the Northern Hemisphere? Your thoughts on the SOI would be welcome. Nice video here with Valentina Zharkova discussing the solar cycles and their direct connection to climate fluctuations. Maybe just a bit more than just the IPCC likes to claim...you think? Ha. What’s the status of the Blob? That will really make a weak El Niño feel strong. If July is the best month, I'll add that I nominate November (in the NW) as the least useful month of the year. All summer activities are off. No swimming, sailing, climbing, too cold/wet to enjoy hiking or biking, but not yet enough snow for skiing. The garden is going dormant. Good only for raking leaves and indoor projects. Oh, and soaking in hot springs. I am preparing to move to England for 6 months (Jan-July 2019). As I watch their weather, I notice that they are predicting devastating snowy conditions in England this winter based on the El Nino prediction in the Pacific. Is this accurate? Also, do you have a weather source that you recommend (for the lay person) that covers weather in Europe? "Plenty of CA transplants, like me, like cool, cold, even snowy weather ... please stop with this passive aggressive nonsense, sadly of course Cliff condones it." So now Cliff is expected be some kind of Hall Monitor, apparently. My goodness, toughen up a bit. "Wait till the wind shifts to the north east and we go down to 15 above, you’ll all be praying for the blob to return". Not us. Instead, we'll hunker down with the dogs in front of the blazing fireplace and wait for the winds to pass, and then we'll go out and play in the fluffy snow. Those conditions say Fraser River Outflow, and given we're at elevation on the side of a hill facing northeast and close to the Strait along the northern Olympic Pen, we get deep upslope snow during FRO events. Take three rambunctious Labs that have been cooped up during the blow and then add cold and snow, and it's a circus in the back hard. Two of my dogs have perfected sliding down my steep hills on their backs and sides. They practice on wet grass in summer most of the year, but snow is what they are really waiting for. So bring it on. The last El Nino (2015-2016) we had way above normal rainfall and only one big ridge that lasted only about 10 days. This after all the forecasts were calling for "warm" (relatively speaking of course) and "dry". I enjoy the contrasts of the seasons on the Washington coast. But mostly tolerate the warm summers in anticipation of our November storms: the wild winds, the pummeling rain, and the gray skies - so easy on these old eyes. But it goes much deeper than that. The winter is our season of recharge in the West; the time to replenish soil moisture and recharge groundwater - greening our corner of the world, giving rise to our iconic clean, clear rivers and streams that are the spawning and rearing habitats of our noble sovereigns, the salmon, steelhead, and trout. Let it rain!